A key goal is to create simple Websites containing information of value, encouraging visitors to register and print out special offers. Hence, it's important to know how a Webpage looks after it's printed. In my opinion, it's very important to ensure that information is transportable, making it easy for people (customers/prospects) to share ideas, recommendations, etc. The easier I make it for prospects and customers to share ideas/information, the shorter the sales cycle. The days of dumping millions of dollars into a massive corporate Website are numbered. Most Internet users complain about poor user interfaces and the time it takes to locate specific information at these sites. The more relevant your Website, the better the results. It makes more sense to build a Micro Website or Landing Page dedicated to a single promotion. 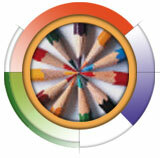 The goal of Always-on Marketing® is to integrate online with offline promotions. Imagine being able to measure direct mail, radio, TV and print advertising effectiveness by directing prospects to an interactive Landing Site. With the help of online reporting, you'll see how effective each campaign tactic is, in real-time. Please read my success stories below to learn more. To promote Websites, I employ innovative e-mail advertising. At preset intervals, I have a system that automatically keeps thousands of prospects and customers informed through soft-educational e-mails. My proven Search Engine Marketing techniques ensure my Website appears on top of major search engine lists (without paying for sponsored links). Consequently, I receive about 250,000 monthly hits, and many visitors stay 30 minutes. My video files are viewed 10,000 times each week. Digital branding is a critical component of online success. Today, word-of-mouth (Viral) email marketing can be more effective in building a brandname than TV airtime or splashy print ad campaigns. Recently, I helped a client fill an independent pet store with customers. This, small, home-town store did more business than two other larger corporate stores combined. Our 700 email blew away the 8,000 email that the corporate HQ did. Imagine cutting through the clutter and eliminating all competitors by branding essential key words as I did with Always-on Marketing.® Search Google now. You'll discover I'm holding the top spots among 30 million search results—without paying for clicks! Now that's Search Engine Marketing at its best. The Wireless-web gives me an additional edge, allowing me effortlessly to fulfill information requests—anywhere, anytime—using my mobile phone. I call this approach eFulfillment. 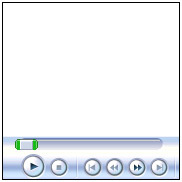 Furthermore, I'm creating next generation mobile-phone Web applications, permitting real-time bidirectional interaction. This approach, allows marketers to stay in constant touch with customers no matter where they are—home, office or anywhere in between. Whether your goal is to rejuvenate your Website, add new features or increase traffic, please consider me. If you look around A2.com, you'll see firsthand what I accomplished with little budget and without the expense of a large staff. A2.com is ranked #1 of 20 million search engine results. Learn how I do it. 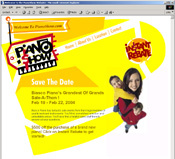 Pianoshow.com: I built an online admin feature allowing a user to create—in minutes—Websites for five shows a week. I also created a custom online reporting and sales tracking system. I boosted overall marketing effectiveness tenfold, while saving the client thousands of dollars weekly. Boyne USA Resorts: I migrated the Website to a new hosting service and integrated an administrative database, allowing Boyne to update site content via any browser. Techstreet: I designed and built a Micro Website to effectively promote its SDO initiative. Additionally, I implemented Always-on Marketing® to automate the delivery of 6,000 e-mails, which drove traffic to the site. ProDial: I automated customer sign-up via the Web. I designed a system to dynamically generate a personalized Webpage to automatically transfer customer information onto a contract for instant printing-on-demand and e-mail routing.